You or your family get Rs. 2 Lac cover for Just Re.1 per month i.e. Rs. 12 per year. Just contact your Bank once and they will open the Insurance account and pay the premium for you year after year from your saving account via auto-debit facility. Even if you register at 18 and die at 70 due to an accident your total contribution for the period would be about Rs.624 (i.e. 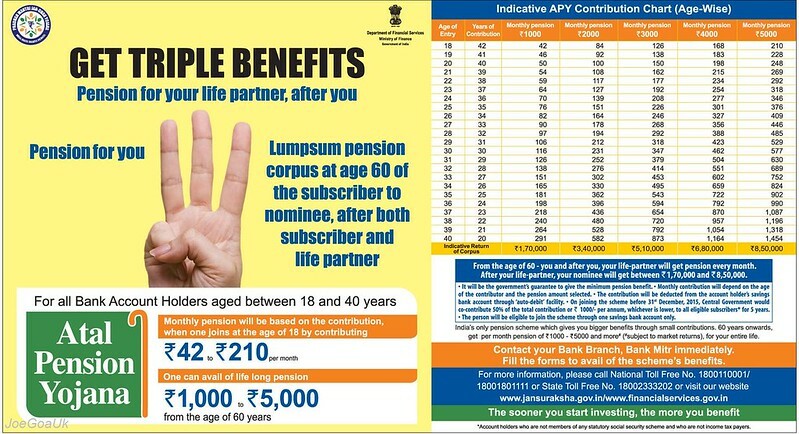 52x12 assuming the premium remained same) but your family will get Rs.2 lac. However, value of Rs.2 Lac in 2067 could be just 20,000, also the annual premium Rs.12 you pay after 2020 would be like going down to Rs.8 Rs.5 and Re.1 . Note: If you do not die in an accident before your 70th birthday or you die a natural death you get nothing. Eligibility: Lower income Goan family (atleast 15 years residence) whose annual income does not exceeds Rs.3 Lac. Looks like this is Term life Insurance Policy . 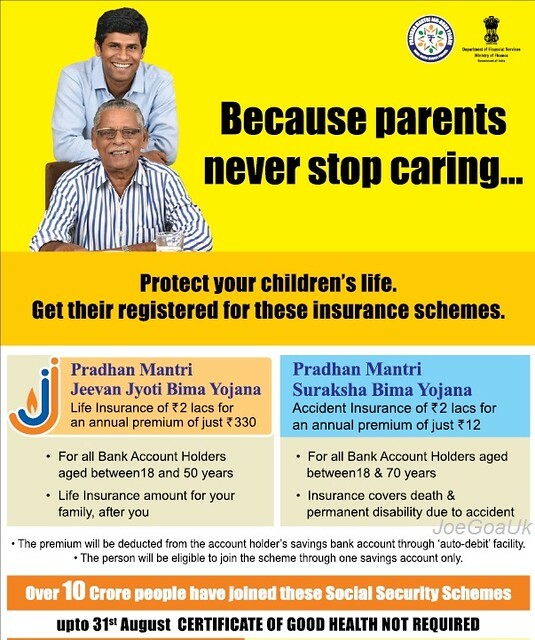 Life Insurance Cover of Rs.2 Lac for those who are 18 - 50 years old only. In this scheme your family gets Rs. 2 Lac after your death due to any cause (accidental, natural death but please do not commit suicide). See 1 above for actual value of 2 lacs etc. 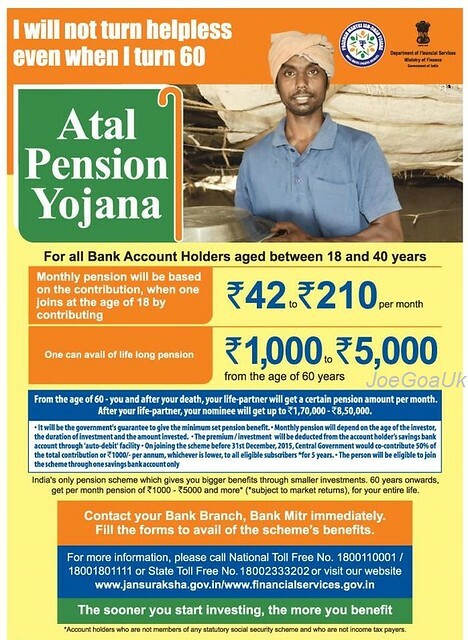 If you take up this insurance at 18 and die say at 55, your total contribution would be Rs.12,210 (Maximum*) i.e. 37x330 (assuming the premium remains unchanged), your family get 2 lac. *You pay upto the age of 55 years. If you die in an accident before 55 you get double or triple benefit Rs.2lac + Rs.2 Lac (assuming you also have Insurance No. 1 above PMSBY), Goans could get upto 6 lacs in case of road accident death as mentioned in 1 above.